That’s a lot of moving parts. When the dust settled, the CPU use on the SQL Server had gone up, not down. So where do we start troubleshooting? I love good developers because they do unit testing. (Yes, readers, that means if you’re not doing unit testing, you’re not a good developer.) The most reliable way to troubleshoot is to boil things down to the simplest repeatable test possible. They identified two different queries that had dramatically different results between the old server and the new server. I looked at the execution plans produced by these queries on both the old and new servers. Everything was identical – same plans, similar reads, similar results – except for one thing: CPU time. You can measure CPU time for a query by executing SET STATISTICS TIME ON in SQL Server Management Studio. From that point forward, all queries in that session will have a bonus set of metrics in the Messages tab listing the milliseconds of CPU time used. Compare the “Specification” line to the “Core Speed” line. As we say in the business, wah wah wah waaaaah. The new CPUs were Intel’s diabolical power-saving Nehalems, which have given me no end of grief. My hat is off to them for saving the planet by using less power, but my pants are down to them for killing performance without informing the users. In the last few weeks, I’ve seen several cases where server upgrades have resulted in worse performance, and one of the key factors has been throttled-down CPUs. In theory, the servers should crank up the juice according to demand, but in reality, that’s rarely the case. Server manufacturers are hiding power-saving settings in the BIOS, and Windows Server ships with a default power-saving option that throttles the CPU down way too often. 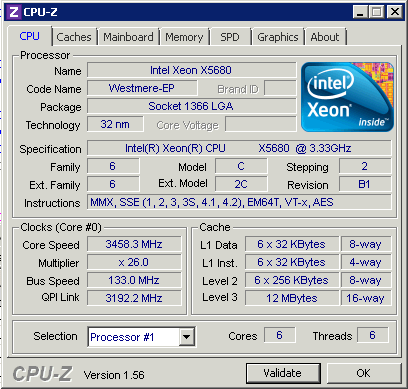 Periodically test your CPUs with CPU-Z. Know their spec speed and their current speed. Saving power by throttling down is fine, but understand that they may not run full speed until they’re under very heavy load. StackOverflow was consistently running 50-60% CPU load, and the processors still weren’t speeding up. Since the power-saving speed was 1.6GHz, their CPU-intensive queries were literally running half as fast as their old server. T-SQL Tuesday: Why Do You Need DBA Skills? Good info on this issue – very important for DBA and infrastructure staff to be aware of the impact and the resolution. Of the 3 provided power management profiles in Windows Server (“power saver”, “balanced”, “high performance”), it appears that the default (and “recommended” – out of the box) power management profile is “balanced”. Changing this setting to “high performance” can make a measurable difference, based on Glenn’s results. Seems like a relatively simple change – who knew? My personal opinion: Aggressive power management profiles (less than “high performance”) are great for laptops (where battery life is a concern) and maybe some servers (where power savings is a greater concern than high performance), but should be avoided on servers having a greater concern for high performance over power savings (like DB servers, VM host servers, etc.). It would be great if Microsoft offered a revealed dialog for the power management setting during OS installation, with perhaps the same default setting of “balanced” but also with the ability to change the setting at OS install time, so that these choices are more explicit and revealed (and less implicit and hidden as they may be now – with the resulting downstream issues). Kind of like the “black art” of disk volume alignment (awareness and resolution) prior to Windows Server 2008 and the automatic creation of 1 MB alignment disk volumes (due to inappropriate default OS settings or actions of the past) – no? My thanks to you and Glenn for revealing this issue to DBAs everywhere! Great post Brent, good to know these things. Im curious if you have looked into the Windows 2008 R2 core parking feature. I would expect it would behave in a similar way but as yet I haven’t had the opportunity to test. No, I haven’t touched core parking at all. This is a great post, and a problem I will be keeping an eye out for in the future. I’m curious your unit testing and how you’re using them. I’ve grown up with the approach that Unit tests should have no external dependencies, including the database. Are your code unit tests calling into the database or did you pick this up with SQL Server based unit testing? Adam – I’m guessing by your comment that you’re a developer. Developers do unit tests of their code, which is good, and database developers do unit tests of their work as well – stored procedures, views, queries, functions, and the like. I am seeing similar problem on my server where CPU-Z reporting lower numbers than what spec says. Is there particular BIOS setting that has to be tweaked to make sure CPUs always operate at full capacity? Igor – yes, the settings depend on your server manufacturer, plus you’ll want to go into the Control Panel in Windows, go into Power, and set it to High Performance. Both the BIOS and Windows settings are necessary. Thanks for the post, i’m also seeing lower numbers than the specs. The server is running some background processing. However if I run a query the core speed jumps to the full speed, which sounds as works as designed. I’m still going to search for the bios settings though and change to maximum powerrrr. Remco – if you run just *one* query and the server goes to full CPU speed, that’s great, but that isn’t what most customers are seeing. Interesting, I have that exact HP model server and problem you describe! The server is two years old now and has run (mostly) great; fixing this should make it feel new again! Thanks! Great article and web cast too, thanks Brent. I tested out 3 servers. All 3 had balanced power plans. Two of them were running at 1.6 GHz while having Xeon 2.53 GHz CPUs. The 3rd one (also balanced) has 2 Xeon 3 GHz CPUs and was measured by CPU-Z several time running at top core speed, even though the CPU usage was at single digit percentage. Great post. I recently took over as Sys Admin with a department that has a fairly beefy computational server. Very useful post. We’re auditing our servers to confirm and adjust their settings if necessary. 1.) Does higher-performance settings reduce the lifespan of the hardware? (thinking along the lines of heat and wear) Just something to consider. 2.) What kind of extra power-consumption is involved? With one or two servers and a monthly fee, who cares. But with thousands of servers, increasing your power consumption by 10% can get expensive. 3.) What effect does power consumption settings have in virtualized environments like EC2? Rob – unfortunately, those are *anything* but quick questions, heh. They’re great questions, beyond what I (or anyone) could answer off the tops of our heads. These are interesting questions, but typically beyond the realm of SQL Servers that are performance-focused. If you’re performance-focused, you’re not running the hardware for more than 3 years tops anyway, and you’re completely okay with extra power consumption. Hope that helps! Congratulations on having the most optimized DB I/O I’ve ever heard of. I’ve never before heard of a 8 core system with 6 SATA drives that needed CPU expansion. I’m guessing your data set is so small and read dominant that 97% of your data is buffered all the time? Ryan – yep, the StackOverflow guys have worked *really* hard at optimizing IO, plus they do some CPU-intensive things that are a little outside of the norm for most SQL Server implementations. Your guesses would make total sense for most SQL Server implementations, but StackOverflow is indeed outside the norm of what most folks see. Pah! My system admins would never setup our corporate SQL Server ESX cluster system like that. In the big picture though isn’t this correct behaviour? I mean you’re looking at detailed stats and unit tests but under genuine load with real users isn’t the server doing what it’s supposed to do and all will work as it should? John – unfortunately, no. Our production servers weren’t going up to full CPU speed even under load. The problem is that the power management features do not react quickly enough to a change in the workload for the processor to increase the clock speed of the core in a timely manner, especially for typical OLTP queries. Thus, you see a pretty significant performance hit when you use the Balanced power plan. My i7-920 on Win7 throttles down to ~1.6ghz at home and parks idle cores, but it will jump back to full speed the instant I need it. I wonder if the server has a bios issue that is causing the CPU to not ramp back up to full speed when needed. Intel documentation shows clock speed changes timed in single digit micro-seconds. There’s no good reason why your chips aren’t ramping up when needed. When I look around the web, Nehalem and Win7/2k8R2 speed issues caused by power savings are random. I would assume the randomness is caused by driver/bios issues. I know my cousin recently was testing some potential i7 servers for his datacenter and he said the new xeons were about twice as fast as the previous generation of xeons for their SQL tests. But he does run Solaris/Linux, so it’s not MS-sql. Brent, Does this issue apply to Windows 2003 as well? Praveen – yep, absolutely, this is a hardware issue. In order to get core speed eq to spec, did you change your power scheme to high performance, or was this strictly a BIOS change? NM – I use the BIOS exclusively because in every server I’ve worked with, the hardware has had a setting that will override the OS. That way, if someone rebuilds the OS down the road, I don’t have to worry about them getting the setting right. I’m usually liberal about running utilities like this, but this worried me. Have you ever had any issues with this utility? Helpful article. It did provide us with some additional information about a server that was under-performing, so now we’ll need the hosting to try and change the setting to see if it helps. We changed this, and updated the BIOS / iLO, and used High Performance, and our performance significantly increased (40% in our end of day process). Changing back to Balanced had minor effects – the big wins were apparently in the BIOS/iLO. (We didn’t have enough of a window to change one thing at a time, alas). I’m running into an interesting issue with a client server. It’s a HP ProLiant BL460c Gen8 Server with 2 Intel Xeon E5-2667 v2 processors. 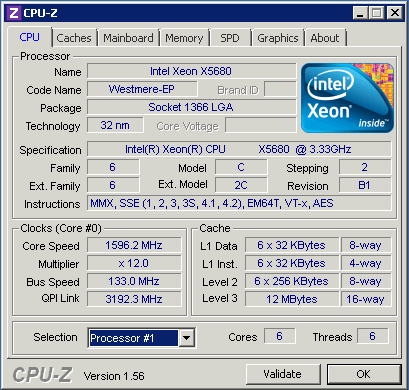 I ran CPU-Z and found that the processors were running at less than half their rated frequency, even under load. I don’t have access to the BIOS settings, so I altered the Windows Power Plan to the “High Performance” plan and the first processor immediately jumped to it’s correct speed. However, the interesting thing is that the second processor continues to run at the throttled frequency. I don’t know if a re-boot will address that or if I need to get IT involved to change the BIOS. I just thought you might find that interesting. Thanks for the article. David – yeah, stuff like that is always tricky. You’re best off getting onto the latest version of the server’s firmware too – there’s often bugs with this type of thing. You came to our offices back in 2011 and the first thing you did was run CPU-Z which revealed that our database server was running at half power. Was I surprised! It turned out to be because our very lazy infrastructure guy set it to that to conserve power because there was not enough available power to our rack for all the servers in it. He’d never thought to mention that to me through all our performance troubleshooting. Heh, yeah! Gotta love those easy, free fixes.